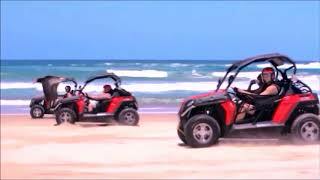 Gold Coast Island Buggy Tours offers a new exciting adventure tour to the Gold Coast. This tour combines four great activities in their half day buggy tour. Your day starts off with a luxury boat cruise to South Stradbroke Island. Sit back, relax and take in the beautiful ocean views. Keep your eyes open as a pod of dolphins are often spotted on the way to the island. Once on the island you hop into your twin share four wheel drive drive buggy. This 90 minute scenic eco tour takes you through the tranquil dense bush, over natural built obstacles, sand dunes and onto the magnificent beach. They'll take you up to the lookout for some spectacular views of the Gold Coast and surrounding islands. before heading back to the island resort. During the tour they stop so you can change drivers and everyone gets a turn to drive through the different terrain. You must have a current driver's license to drive a buggy. Next time for some segway riding through their special built bush course. Now it's time to relax at Couran Cove Island Resort, go explore, purchase something to eat drink or go for a swim. Half day island self drive, twin share, four wheel drive buggy eco-tour. The tour includes Segway riding and a luxury boat cruise to and from South Stradbroke Island.